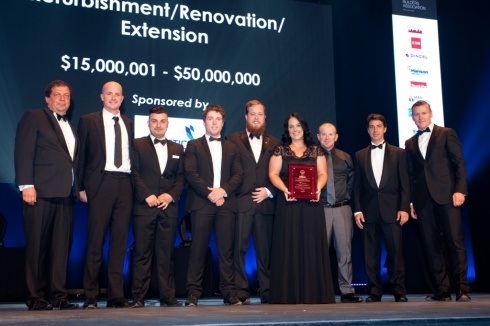 Saturday evening at The Star in Sydney for the 2015 MBA NSW Awards proved successful for Kane Constructions, taking home the award for Excellence in Construction for Refurbishment/Renovation/Extension projects $15M-$50M. 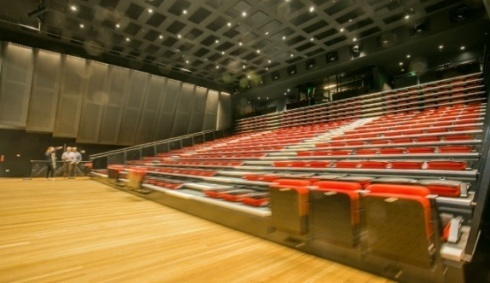 The state-of-the-art Blue Mountains Theatre & Community Hub in Springwood is a testament to Kane’s persistent and professional approach to project delivery. Designed by FJMT and our good friends, David Mitchell Architects, the Theatre & Community Hub was a perfect illustration of how a team can add value through true collaboration and innovative value management. The Kane team included Emma Ratcliffe, Chris Cunico, Peter Milne, Tony Macan, Dan Butler, Adam Bennett and Angelo Hatgiantoniou. The Design Team was David Mitchell Architects, Taylor Thompson Whitting (Structural), Warren Smith and Partners (Hydraulic) and Steensen Varming (Electrical). We congratulate the Blue Mountains City Council on bringing to the community such a crucial and beautiful space.